Supported by a McCormick Catalyst Award, a McCormick Undergraduate Summer Research Opportunity Award, and funding from the Air Force’s Office of Scientific Research, Grayson’s research was published on October 28 online in the journal Physical Review Letters ("Analyzing Longitudinal Magnetoresistance Asymmetry to Quantify Doping Gradients: Generalization of the van der Pauw Method"). Graduate student Wang Zhou is first author of the paper. Undergraduate Heun-Mo Yoo used a Global McCormick Student Ambassador Award to travel to ETH Zurich in Switzerland to help grow the samples and conduct resistivity measurements. 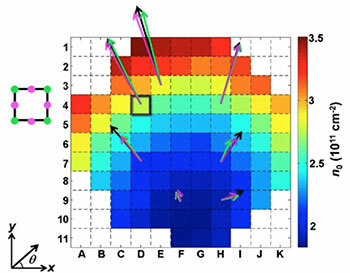 A density color map of a two-inch wafer, calibrated by dicing into samples and measuring the local density of various samples.